Ben Affleck has been mum ever since the news broke last month that he’d be playing Batman in Zack Snyder’s sequel to this summer’s Man Of Steel, the tentatively titled Batman vs Superman. But tonight’s Late Night with Jimmy Fallon, Affleck finally broke his silence to host Jimmy Fallon about being cast as the Caped Crusader and how he faced the fan reaction. One of the most interesting things Affleck mentions is that Warner Bros. tried to prepare him for fan backlash to his casting by showing him previous harsh reactions to other Batman movie castings. They also told him to stay off the Internet for a few days post-announcement, but, as you’ll find out from the interview, the actor did not heed their warning. This interview is definitely worth watching. I watch stuff like this and think, how can anyone NOT like Ben Affleck? (Be sure to get your very own Batfleck Shirt.) I love how Fallon brought up bringing the upcoming Superman sequel to Comic-Con for the fans. 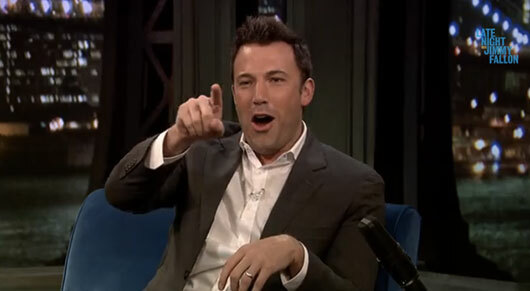 I know I’m looking forward to seeing Affleck at the WB’s likely Batman vs. Superman at SDCC. This was my favorite part of the interview and it shows that Ben Affleck is a good sport, so I had to make a gif of it.